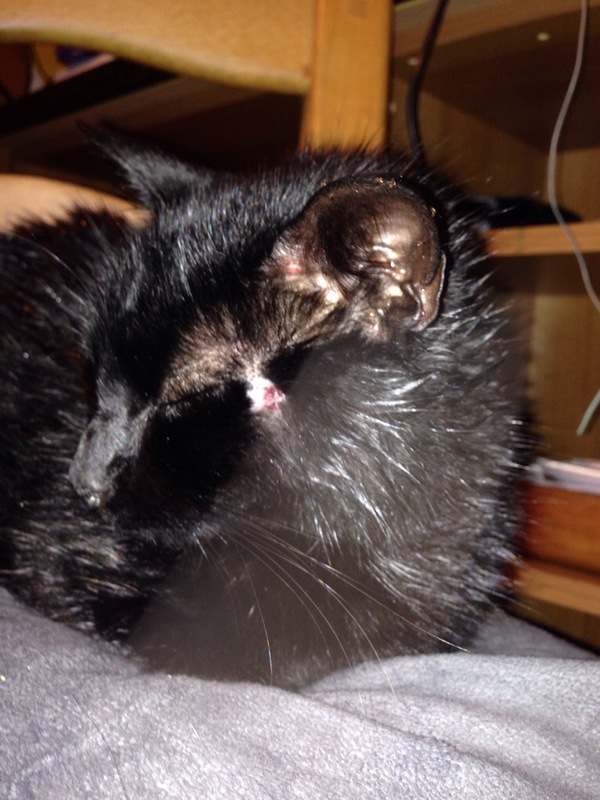 Unfortunately one of my cats was hit by a car last night but fortunately the person that hit her let me know asap, so I found the cat and took her in. She was hiding in a bush & only spotted her because her eyes reflected the torch. She ran away from me but I managed to catch her. She seemed ok, apart from a graze above her eye but her eyes were responding correctly to light, so hopefully no concussion/brain damage. She spent the night on a cushion by the fire in my parents’ house and, by the time I had gone to check on her this morning, she had been up and about and even rolled over to let me rub her tummy. 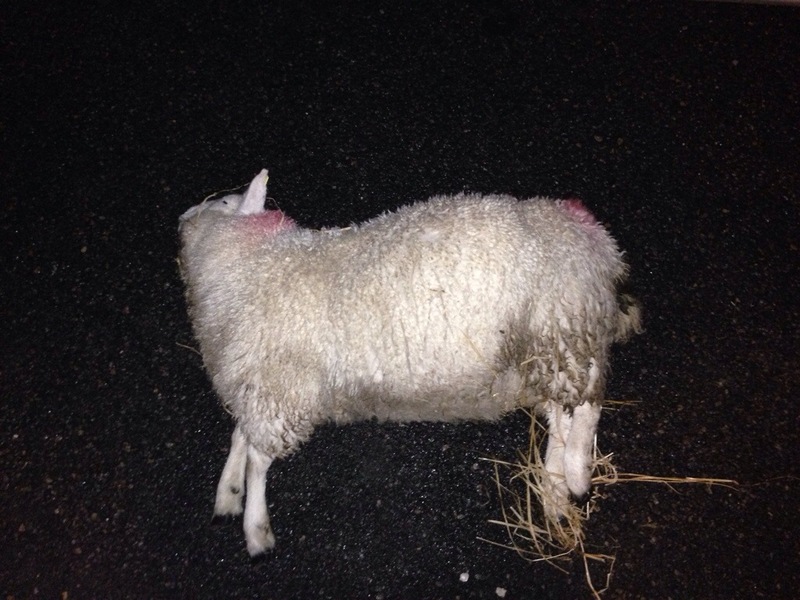 I posted yesterday about a sick lamb that I had taken into the barn. Unfortunately when I went to check on it this morning, it was dead. I posted this on my Air An Lot facebook page, promoting some discussion. 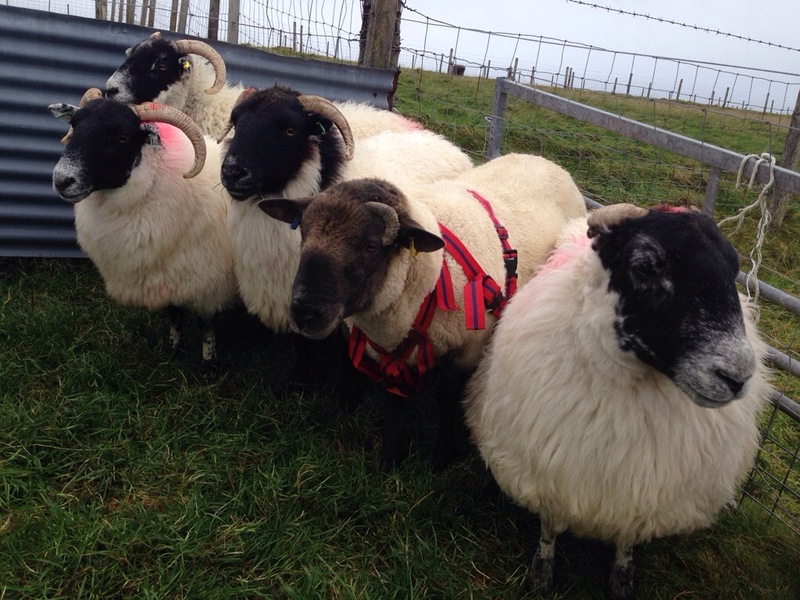 My friend and former BBC colleague, Iain Stephen Morrison (who runs Uist Zwartbles) mentioned Heptavac P vaccine. Now this is something I have been meaning to start doing for a few years, but one of these things that is easily postponed and left on the to-do list. Not any more. I went to the vet today and bought the vaccine. Hopefully I’ll be able to administer first dose on Saturday, with a second in 4-6 weeks. 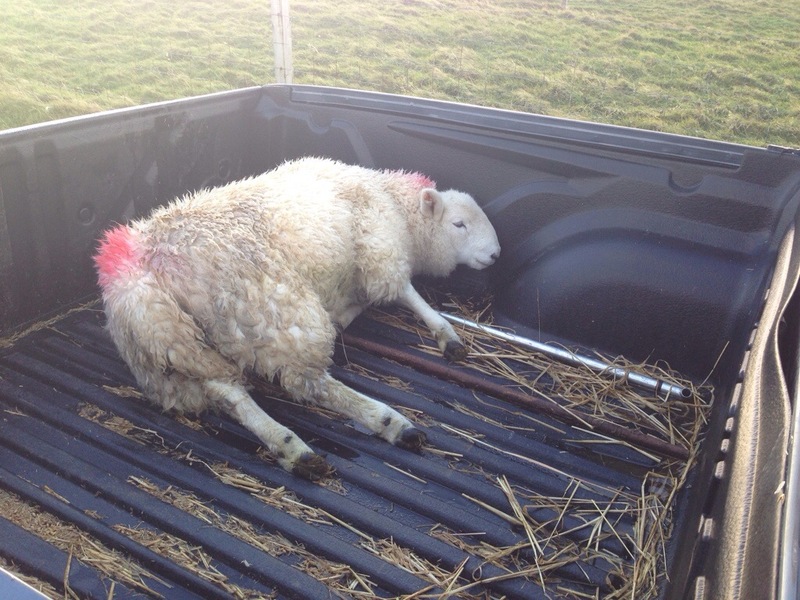 But back to the job in hand, and I had to bury the lamb when I got home. Oh the joys. 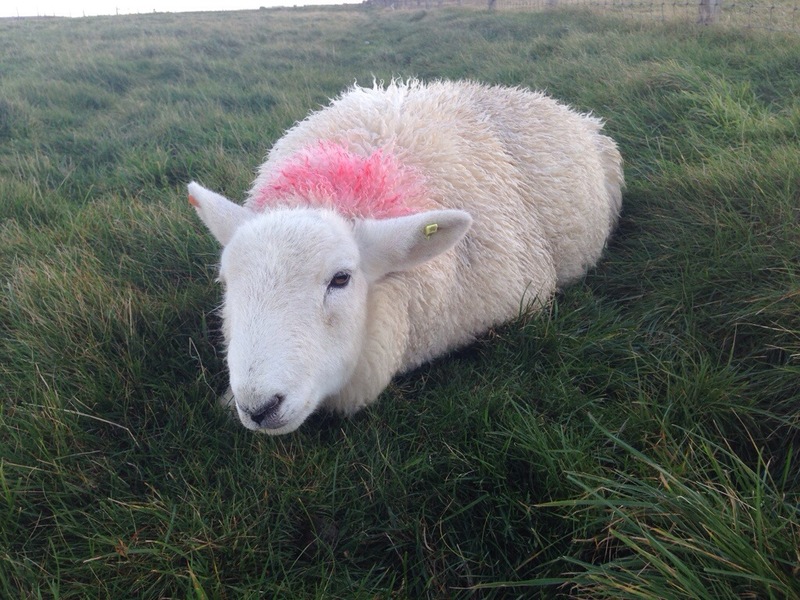 I’ve just sat down after an hour or two of trying to diagnose and treat a sick lamb. 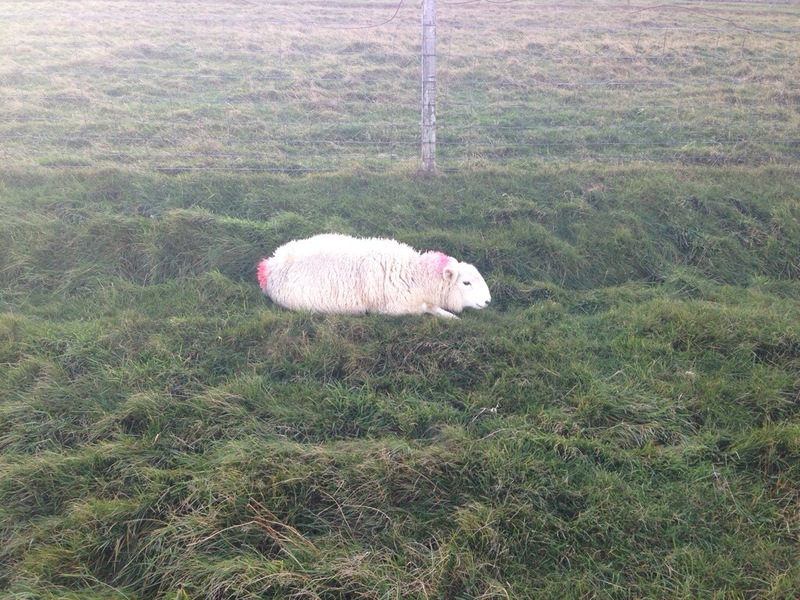 I went in for a walk with Bud earlier, and noticed one of the lambs lying down, when the rest were on their feet. This doesn’t necessarily mean their is anything wrong, but it made me suspicious – and I was right. The rest of the lambs cleared off as soon as I jumped the fence, leaving this one on its own. Obvious now that there is something wrong. I went out to get the pickup but because of where it was, I had to carry it over 3 fences to get it to the vehicle. 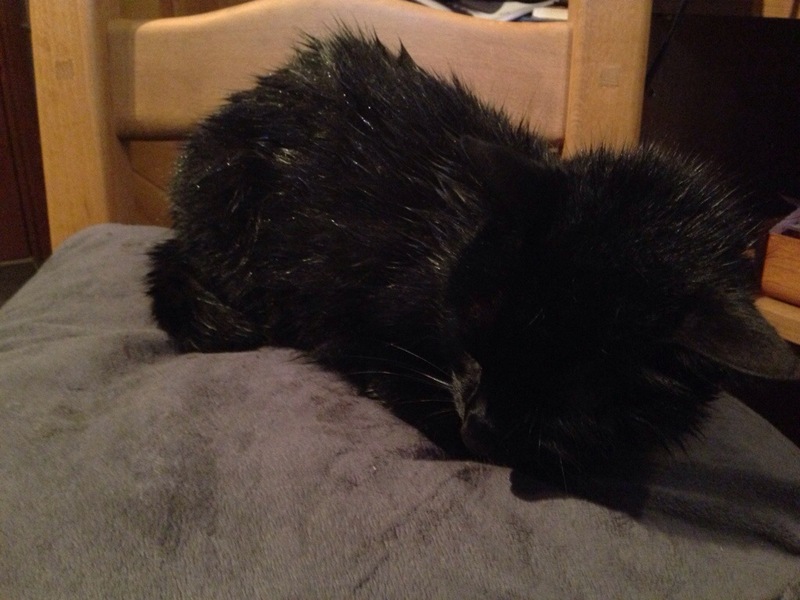 Since then, I have taken it to an elder statesman in the village, for his opinion, and spoken to the vet. The vet suspects either a lungworm or pneumonia. I drenched the animals around a month ago, when we were dipping them, but it wasn’t my usual drench, so not 100% sure if it covered lungworm. I’ll have to check that. I’ve since bought some combinex, so I’ve given it some of that, and also started a course of penicillin. 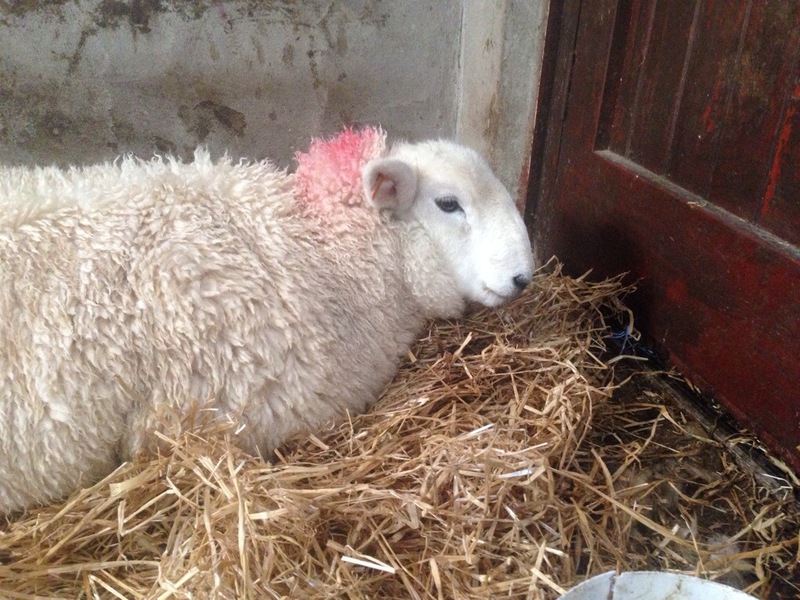 It’s in the barn now and I’ll keep an eye on progress and call the vet out, if required. I’m Donald Macsween, from Ness in the north of Lewis. 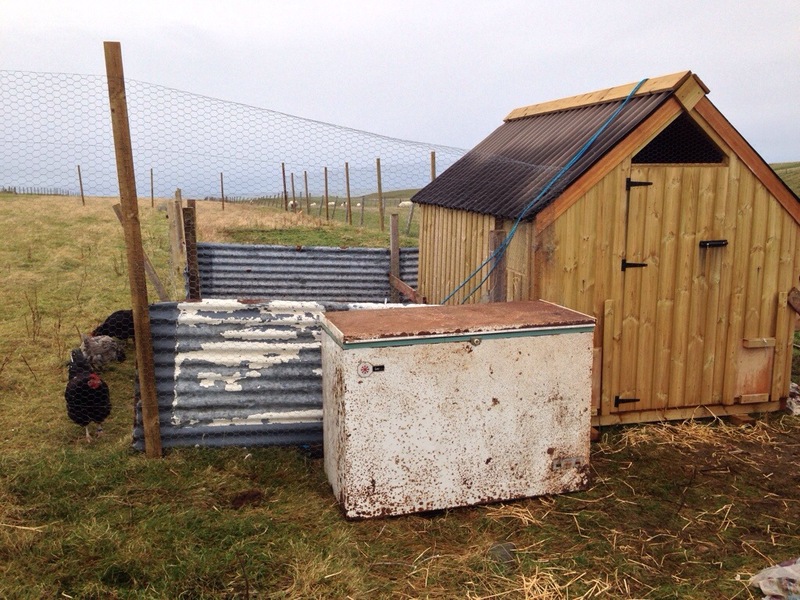 I have officially been a crofter for eight years, since receiving my croft as a 21st birthday present – probably the best present I could have received. My family have always been crofters and many of my first memories involve sheep; from lambing to home kill, we were introduced to all aspects from an early age. Today, I’m often asked to describe what being a crofter is all about, and it’s not an easy thing to define at all. 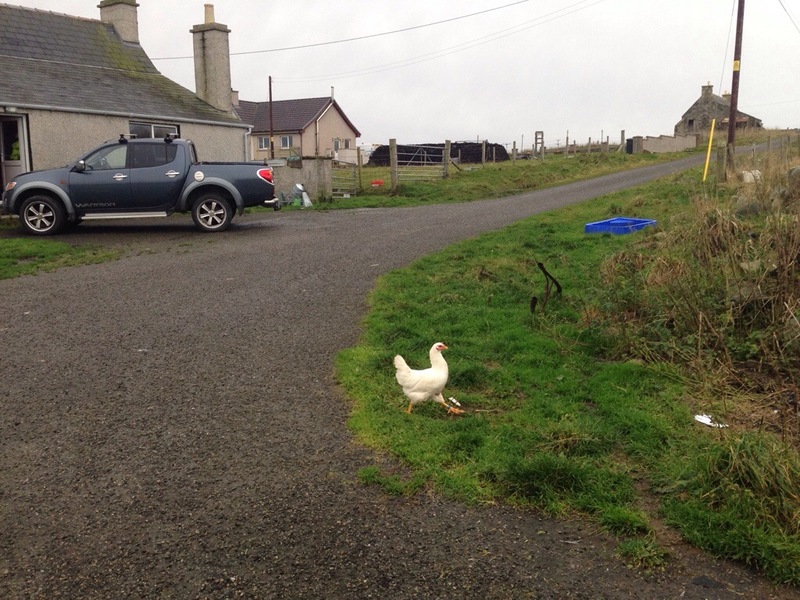 There is the old adage “a croft is a piece of land surrounded by legislation”, but where does that leave the crofter? I often find myself describing crofting as a mind-set, rather than a ‘job’. Times may have changed, but I don’t think the crofting mentality has; traditionally you would have the crofter/weaver or the crofter/fisherman, but today you have the crofter/architect or crofter/joiner. If you get the work/life balance right, I think it can provide you with one of the most satisfying ways of life available in this country. I have worked on this balance myself for several years. It is so tempting to throw yourself either into full-time employment or have a stab at full-time crofting, but the sweet spot is somewhere in the middle. I have worked in several different posts in the past few years, many in media but also time spent with the RSPB (counting Corncrakes) and the local council. 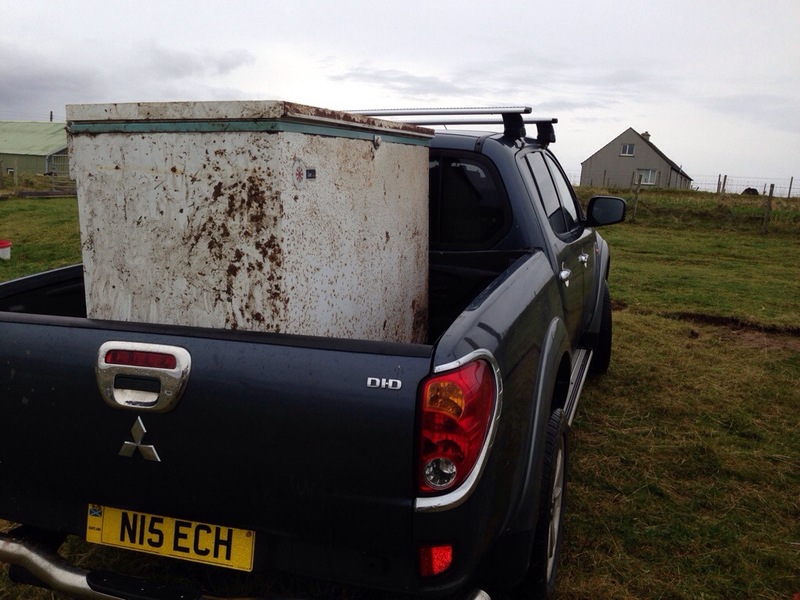 The one ‘job’ that has remained constant has been the crofting – but I think all the other roles compliment it. I like to think that I can show other young people that they don’t have to give up their dreams of being whatever they want to be, and have crofting as a second rate lifestyle. The opposite is true, in my experience. Crofting can be your release from the day-to-day monotony of office work, or from the unpredictability of other types of employment. Life on the croft has given me some of the most exciting days of my life, and provided a level of continuity at the same time. In a time when more and more of us have to show a spirit of enterprise and be multi-skilled, crofting is ideally situated to fit in this modern, yet traditional world. I still don’t know how to define a crofter, but I know there is still a place for us in the 21st century. I helped a neighbour get his ram out with the ewes on Friday. We caught him & I left a wee bucket of feed with him, to keep him quiet. 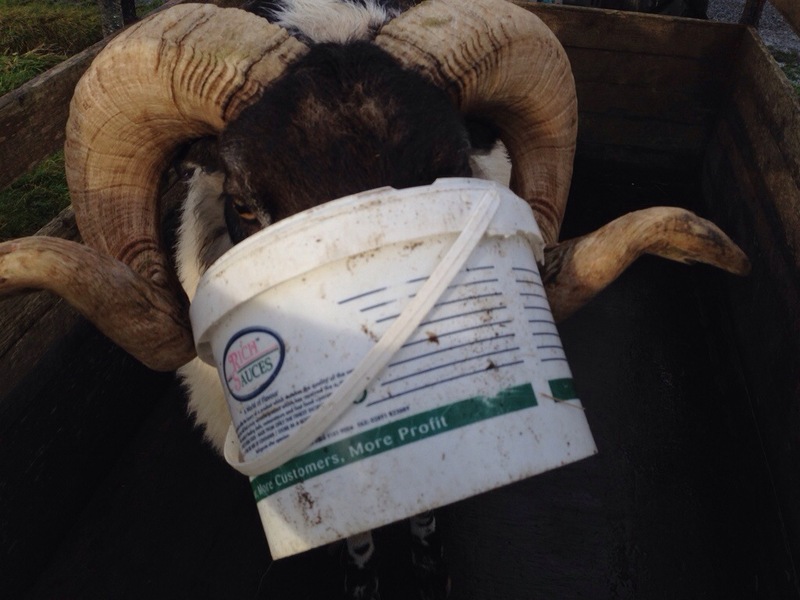 Turned my back and two minutes later the bucket was jammed between his horns! From now until May, Saturdays are going to be busy. The days are much shorter, so I don’t get anything done during the week, meaning all my chores have to be squeezed into a few hours on Saturday. Today was the real start of my winter, but I took it quite easy! No idea at all how it escaped. I put it back in and then decided that it was time to clean out the henhouse. The hens have been there permanently for a week now, but 10-20 have been using it for around a month, so it needed cleaning out. It stank. Wasn’t nice. I got it done! As I was topping up the feeders & the water, I thought that it would be so much easier if I could have the food stored nearby, instead of out at the house or barn. I’ve been thinking about this for a while, but decided to get my finger out today. I went down to the Habost Amenity Site – waste/recycling point on the site of the old dump – still referred to as the dump locally. There, I ‘recycled’ this fine storage unit. Yes, it’s an old freezer! Judging by the sheep feed in the bottom, another crofter had been using it as a similar store. That’s it now beside the hen house, with half a bale of straw and some bags of feed in it. With the lid anchored down by the biggest stone I could find. My parents have been away for the last couple of days, so I went out to theirs to feed the cats. 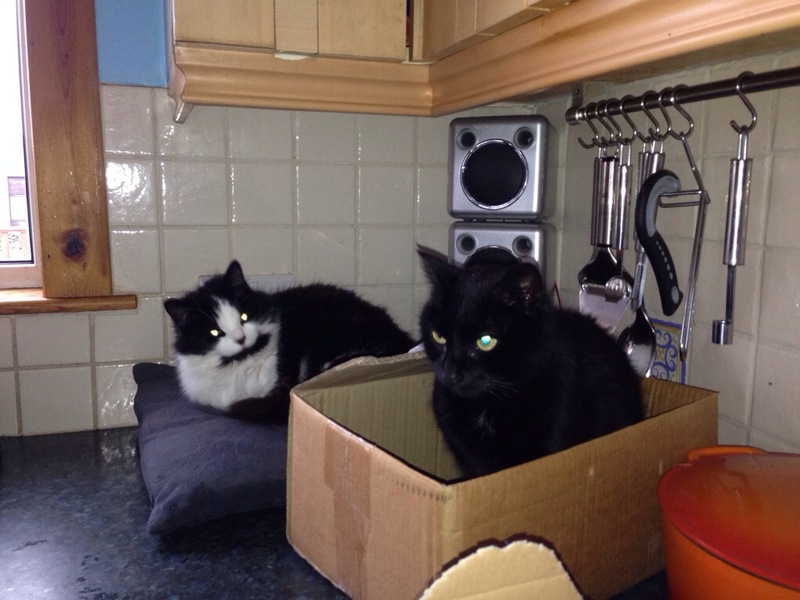 I had a wee chuckle to myself when I saw the cats waiting for me! 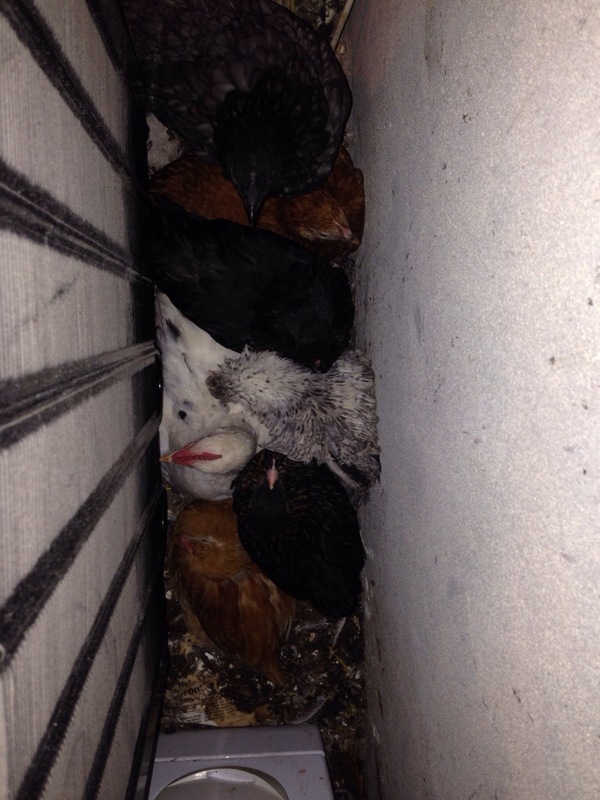 I have 7 chicks in the barn. They are coming on nicely and I let them out every day. They’re funny wee animals, they sleep in behind one of the freezers! He has served 3/4 of his 20+ sheep, but the Suffolk hasn’t done ANY of his. Not time to ring any alarm bells just yet, but I caught him today, just to make sure his harness was properly fitted. 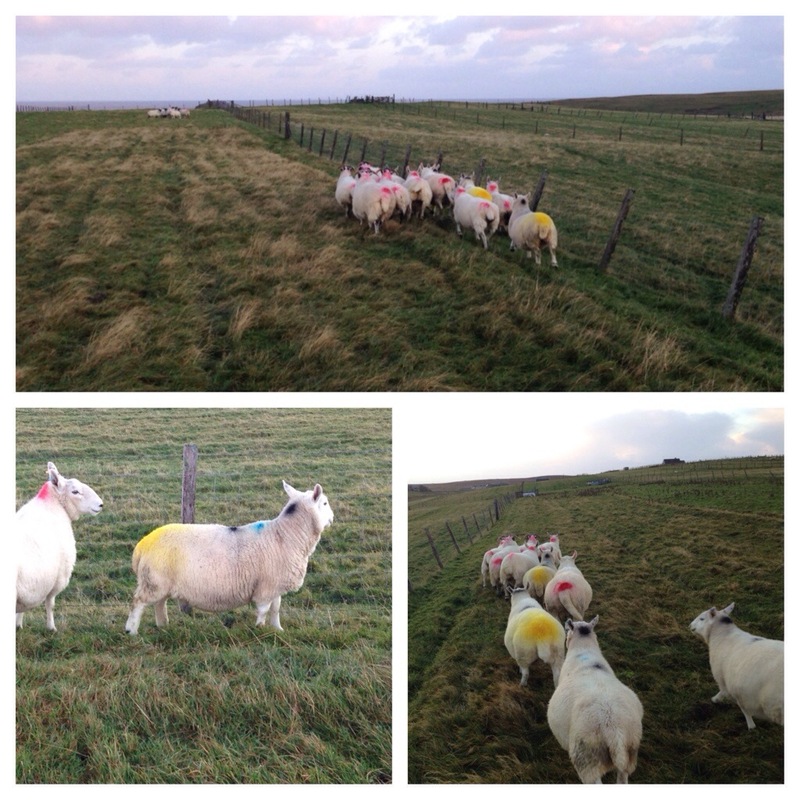 I tightened it up a wee bit, so hopefully I’ll see some orange markings on the sheep soon! Bud came in with me too. 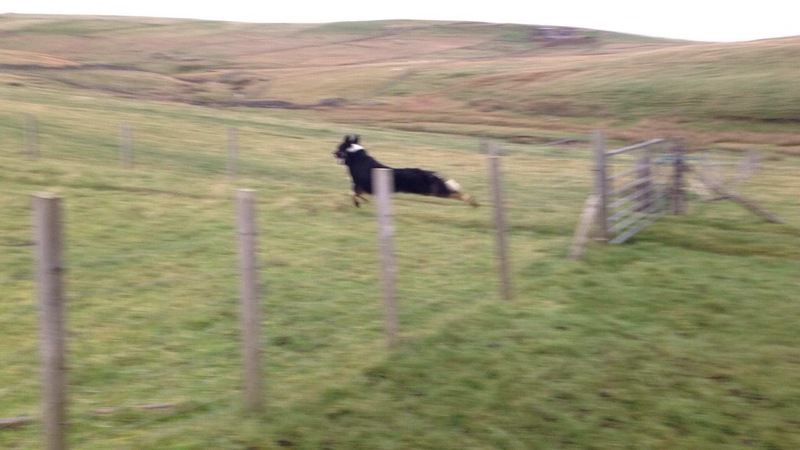 Here he is flying over the fence!